Our requirements were specific, unusual & challenging & Nick visited the site to ensure the understood what we wanted & how best to achieve it. The quote was competitive & detailed & final cost consistent. Nick was clear about when work could be scheduled. Overall, really happy with the work, service & cost. We would recommend Acorn Fencing. Nick and Matt were excellent and transformed my old 190 foot fence into a new sturdy and good looking fence. They were hard working and tidy. I'm amazed at how much they did in 2-5 days! The finishing touches (trench capping and post caps) just complete the look. It has absolutely transformed my garden and I would recommend Acorn Fencing & Decking to anyone needing any work done. I'm already considering getting them to do my decking/garden plans next year! 1st class job, would use again. Nick at Acorn completed the job on budget/quote to a high standard. Would easily recommend him & use his company again. The work was carried out in a professional manner. I would like to thank Nick and Matt for our brilliant raised decking. They have both worked so well and we are so happy with the end product. A brilliant and huge decking area. Would recommend Acorn!! Put in a complete back fence, replaced side panels and built and installed a side gate. Great quality and all very professional at a very good price. Just cannot fault them. First class job done and a good price, excellent materials used, very pleased. Would recommend highly. Fantastic fencing work, a job well done! Nick and Matt were well organised, punctual, professional and friendly. Hard working come rain or shine and always seeked approval on awkward parts so i was happy with what they were going to do. Very happy with both front and back fences. Will definitely be using them again for further work in the future. Mr Nick Felthom did a brilliant job with my fence after it was broken by the storm. He is a very good worker, on time and very good. I am very pleased with the job he did. We hired Nick to build a raised deck leading from our French doors into our back garden, and we couldn’t be happier with the result – it has exceeded our expectations. Previous experiences had left me with a certain amount of anxiety when it came to hiring contractors. Indeed, I had pretty much decided I was going build the deck myself, but thought I had better get a few quotes first, to make sure I was heading in the right direction, in terms of build and cost. 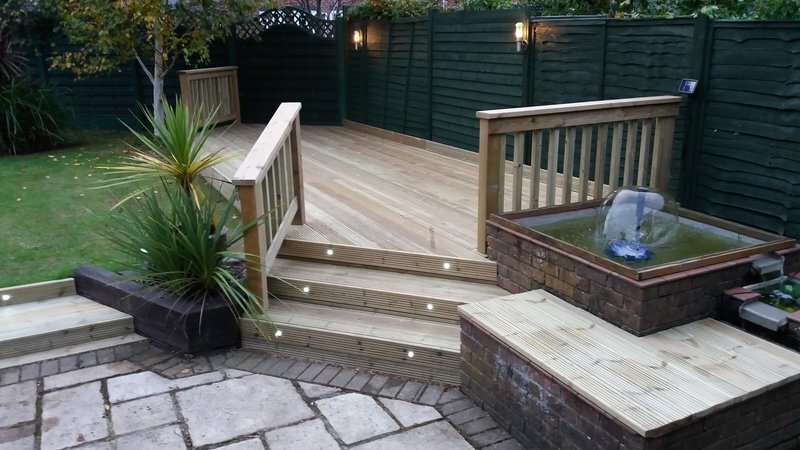 When Nick came round to discuss the plan for the decking, and to give us a quote, we were immediately struck by how much we felt we could trust him. We were also immediately struck by how little extra money it was going to cost to hire him, compared to how much I had calculated it was going to cost to do the work myself – so we hired him! At every point of the process Nick listened to our concerns, consulted us on exactly what we wanted, and talked us through exactly what he was doing, whenever we asked him. He was also very flexible, and took any changes we wanted to make, whilst construction was already in process, in his stride. I have seen a lot of decking over the years, but the one that Nick built for us is by far the most attractive and best engineered that I have come across. Apart from that, I can second all the positive comments that I have read about Nick, from other people on this website, and I can thoroughly recommend him to anyone who wants a deck built – he truly is a ‘trusted trader’. Very impressed with the fence and gate we had fitted. Lovely gentleman, couldn't do too much for you. Quick and efficient. Highly recommend. Nick fitted a single gate, double gate and some fencing for us. Despite the constant rain, he worked very hard and we are very pleased with the results. We received good value for money and would not hesitate to use Nick again. Nick came to replace our fence and gate and the finish of work is excellent. We are really pleased with the quality of work completed. There were a couple of issues with neighbours which Nick overcame. Our garden was left clean and tidy. A good job done, very pleased with the work done, would certainly recommend. Very pleasant man. Our fence was fitted superbly and they worked really hard cutting through tree roots. An excellent example of old time values, arrived on time, worked hard and finished on time leaving the site clean and tidy. To sum up in one word-brilliant! They did an excellent, high quality job on the date agreed. Very pleased with the work and would certainly hire them again. Top quality materials and workmanship. Prompt response to enquiries, good experience. Prompt, polite, efficient, high level of workmanship. Nick & Andy from Acorn did a great job constructing a length of close board fencing plus garden gate and extra gate posts. The quality of supplied material was good and it was expertly installed. Any potential issues with existing hedge sections handled without trouble. Work site kept clean and tidy and all was achieved with friendly service. Really pleased with the result. Would not hesitate to recommend them to others and to have them back for future work. Good work - very satisfied. Hi David, We are glad you are happy with the work we carried out recently for you. Thank you for your recommendation. 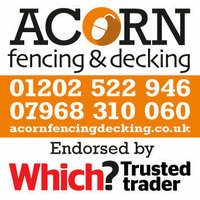 Best wishes Nick Feltham Proprietor Acorn Fencing and Decking. Took advice on which fencing to use, very pleased with result. Very pleased with cost. Acorn Fencing and Decking were recommended to us by a friend. What we wanted was 36 feet of fencing with concrete posts. We wanted a very strong, long lasting fence. Acorn Fencing came out and quoted us for the job - we'd had other quotes too so knew roughly how much. They were prompt and friendly. We can't say how impressed we are with the work they have done. I feel sure the fence will last forever! They were tidy. Definitely recommend the workmanship. Arrived on time, very pleased with quality of workmanship & materials used. I would use this company again and recommend to others. 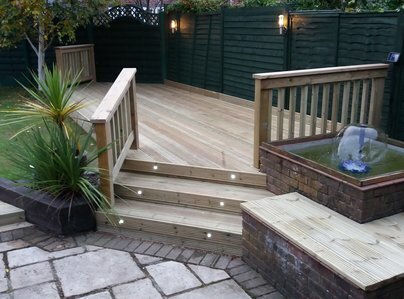 We asked acorn fencing to quote for the reconstruction of decayed decking and pergola. Their quote was detailed & competitively priced. They were punctual, skilled and efficient, additionally, the team were all very pleasant and helpful. The end result was a terrific job, Well done. This is the second time I have used Acorn Fencing. Excellent work carried out to a very high standard, waste removed and all tidied up afterwards. I would definitely recommend this firm. Good friendly, polite and courteous service throughout. Options clearly explained for the quote. Prompt service. Good workmanship results in a very satisfactory job. I am very pleased with a very tidy job at a competitive price and have already recommended this trader to other people. Very helpful and professional throughout - a very good job with a very pleasing result.